Hey Ya'll! It's my first post of 2018 and I'm very excited about it. This giveaway is special to me because it features products from one of my friends from college, Davon Clark. After graduating from college, while substitute teaching, Davon noticed a lack of excitement for literacy in schools. To combat that, he created his own interactive children's book, and that is how the Adventures of Prada Enchilada series and the ADC Kid brand was born. 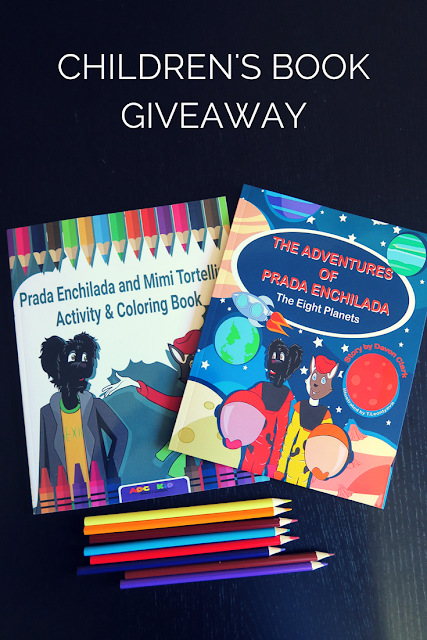 I'm giving away a copy of The Adventures of Prada Enchilada, The Eight Planets and a Prada Enchilada and Mimi Tortellini Activity & Coloring Book. The Adventures of Prada Enchilada, The Eight Planets is geared towards 2nd graders going into 3rd grade, but the basic message of learning about the planets, color identification, fun facts, and utilizing basic counting skills can be used with any child. The activity book can be used by anyone. It has color by number, color by letters, connect the dots, hidden object pages, and more. BabyCakes even enjoys coloring in it. ADC Kid has served over a thousand youth in schools, businesses, community centers, juvenile detention centers, and non-profit organizations. If you work with children and are interested in having them visit your school check out their website. To enter the giveaway use the Rafflecopter widget below! I'll be taking entries until January 24th.